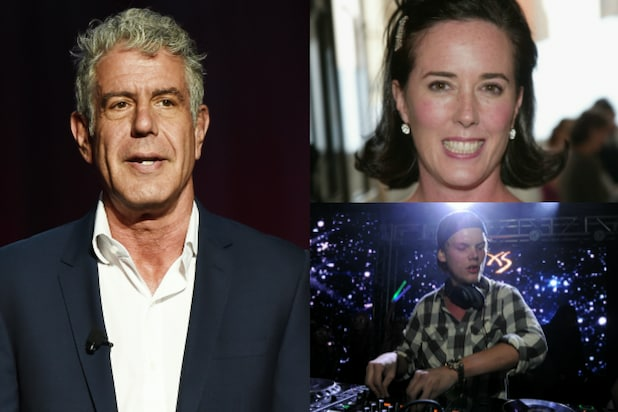 The deaths of Kate Spade and Anthony Bourdain in a single week have led to a sharp increase in calls to suicide prevention hotlines. Publicity around the suicides of famous people has been linked to increases in suicide, and the phenomenon is nothing new: Marilyn Monroe’s death in August 1962 was followed by a 12 percent increase in suicides nationwide, and 303 more people died than in August of the previous year, according to a study published in the Journal of Epidemiology & Community Health. The thought of more people needing to call is upsetting, but at least indicates people are reaching out for help. The number for the National Suicide Prevention Lifeline is 1-800-273-8255. Foster said the organization, which usually receives around 800 calls and texts a month, has already answered about 400 this month. The National Suicide Prevention Hotline, the largest in the country, told TheWrap it experienced a 25 percent increase in call volume over the past two days compared to the same time period last week. “The Lifeline phone number is being shared widely as a resource by the media and on social media platforms, resulting in more people being aware of the resource and calling the Lifeline to get help,” the hotline’s communications director, Frances Gonzalez, said. A third suicide hotline, REAL Crisis Intervention, which receives an average of 250 calls per day, had already fielded more than 200 calls by Friday afternoon. Last month was one of the busiest yet, with 8,146 calls — nearly 1,000 more than the month before. The death of Swedish DJ Avicii may have been a factor, Tracy Kennedy, the hotline’s assistant director, told TheWrap. Tuesday, the day Spade was found dead, was the busiest day of the year so far, with 333 calls. Kennedy said she also brought in extra staff on Friday. Robin Williams’ death by suicide in 2014 similarly caused a 10 percent increase in suicides in the five months after his passing, according to a recent study published in the journal, PLOS ONE. But increases in calls to suicide hotlines are positive, in that they indicate people are looking for help.